The health benefits provided by the yacon plant have been utilized for many hundreds of years, and its use both a food and a medicinal compound can be traced at least as far back as the ancient Incan civilization (1438). The weight loss potential of the plant was never put under the microscope though, until 2004, when a team of scientists at the Universidad Nacional Mayor de San Marcos (Peru), began testing various forms of yacon extract and discovered the inherent fructooligosaccharides (FOS) can promote weight loss when consumed on a daily basis. The scientists also noted that, of all the yacon compounds tested, yacon root provided the best results and, despite its sweet taste, any rise in blood sugar levels was minimal. Despite such positive results, on two separate occasion, in tests conducted by different groups of scientists; the mass media remained ignorant to the potential weight loss benefits of yacon syrup, and may possibly have remained so if it were not for the intervention of the TV nutrition and weight loss expert, Dr. Mehmet Oz. When Dr. Oz became aware of the aforementioned tests on yacon root, and yacon syrup in particular, he decided to feature it on one of his shows. The show was first aired in November 2013 and it is this show that is responsible for the present buzz that surrounds the syrup. One of the main reasons behind the success of the show, and the subsequent marketing success of yacon syrup, could be due to the way Oz presented his show. He put together a team of doctors and nutrition experts and asked them to share their views on the benefits of yacon syrup as pertains to weight loss, and the majority of these experts agreed the compound appears to have potential. He referred to the positive results garnered from the previous tests. Oz conducted his own independent test— The Yacon Syrup Project. The combined weight loss came to 153 lbs. and 27 of the women stated they recommended yacon syrup for weight loss. One of the most interesting things about this test is the women were encouraged not to make any changes to their normal diet or any fitness routine that they may or may not have been following when the test began. Oz wanted to see if the syrup could benefit dieters as a stand-alone product and the test results suggest that it can. It is so low in calories that its consumption is unlikely to result in weight gain. It is a prebiotic that can produce weight loss by redressing the balance between friendly and non-friendly bacteria in the colon and lower intestine. The reason FOS is so low in calories is due to its ability to resist the digestive enzymes. This allows it to pass straight through the stomach without causing any rise in the blood sugar level that may then result in the formation of fresh body fat. The prebiotic nature of FOS is infinitely more interesting though. The colon and intestines contain two different kinds of bacteria, the non-friendly (which can contribute to weight gain) and the friendly (Bifidobacterium and Lactobacillius). Dr. Oz dubbed these the “skinny bacteria” because of their power to facilitate weight loss. In many ways FOS could be seen as being friendly towards friendly bacteria, because its presence in the gut feeds them and results in their increasing in number; but FOS restricts the growth of unfriendly bacteria. This produces several notable benefits, including more efficient digestion of food, and this can be very beneficial to weight loss. It seems likely that further study could reveal even more about the health potential of FOS and how it enables yacon syrup to be such a valuable weight loss tool, but maybe the “how”s and “why”s are not as important as the results, and the results so far look very good indeed. 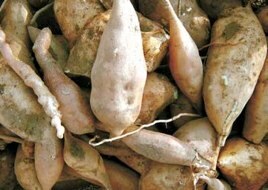 As mentioned above Yacon Root supplements are now available and proving to be very much in demand. UK based slimming supplement Evolution Slimming have a premier product for sale that is arguably the best in the industry. 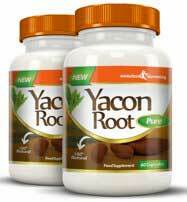 Yacon Root 500mg provides the exact daily dose of yacon and does not contain any artificial stimulants or additives.